University of Notre Dame Press, 2018. Fortunately, many of the selections included in Twilight come from sources I rarely, if ever, read. Locked in a conservative echo chamber, I now learn that I have missed numerous Bacevich contributions in such unlikely places as Harper’s Magazine, Commonweal, Boston Review, Chronicle of Higher Education, New Left Review, Wilson’s Quarterly, The Baffler, The Boston Globe, and The London Review of Books. Unwitting parochial conservatives owe UND Press a debt of gratitude for assembling essays that might otherwise have escaped our attention as they clanged around the antipodes of liberal echo chambers. More importantly, readers will recognize that Bacevich’s anti-intervention, pro-American, genuinely conservative thought receives a heartier welcome in some precincts of the left than it does anywhere within the Republican Party, which he informs us now stands for little more than corporate tax cuts, environmental degradation, and endless, unnecessary, and immoral foreign wars. Bacevich’s Twilight articles identify these three pressing concerns, along with several minor ones, as the avoidable causes that could eventually lead to our nation’s ignominious collapse. And after reading the book, it appears the American twilight of the book’s title might just set on us sooner than even doomsday conservatives fear. Twilight divides Bacevich’s articles into four provocative sections—“Poseurs and Prophets,” “History and Myth,” “War and Empire,” and “Politics and Culture”—each of which could stand alone as its own book. An ominous “beginning of the end” spirit looms as a unifying theme. Titles such as “Save Us From Washington’s Visionaries,” “Slouching Towards Mar-a-Lago,” and “Selling Our Souls: Of Idolatry and iPhones” will remind honest observers that the United States is hurtling down a suicidal path of suffocating debt, perpetual war, and toxic frivolity. His dissents from the Acela/Morning Joe/Council on Foreign Relations orthodoxy provide insight one will not find in National Review, the New York Times, or any other mainstream American Pravda. Bacevich speaks truths many Americans, and all their leaders, refuse to face. American opinion makers prefer obfuscation to reality, as when they describe the Vietnam War as a “quagmire,” an imbroglio we unwittingly stumbled into only to learn we couldn’t later extricate our troops without losing face. Fifty-eight thousand dead American servicemen later and losing face wasn’t such a bad option after all. Unlike his dishonest interlocutors, Bacevich cuts through the historical subterfuge when he describes the American misadventure in Vietnam as “stupid and catastrophic.” He should know; he did a year of combat duty there after his 1969 West Point graduation. We should learn from Bacevich’s condign description, but we won’t. As he states in another essay, instead of absorbing historical lessons from the torment of Vietnam, Americans prefer “history that lets us feel good, even as it makes us stupid.” Blinded by historical obliviousness, we hasten our imminent demise. We nation build in God-forsaken locales like Iraq and Afghanistan. We antagonize Russia by pushing NATO’s perimeter ever eastward. We refuse to acknowledge—at the insistence of the Israel Lobby, Miami’s Cuban exile community, and whoever funds the Kurdish faction in D.C.—that nations don’t have permanent friends or enemies, they have interests. Bacevich barely contains his disdain for America’s military leaders when he mocks them as “the least accountable members of the American elite.” His cutting assessment of his former peers is all the more poignant when one recalls the May 2007 combat death of his only son in Iraq. If anyone has the right to poke our sacrosanct military brass in the eye and disparage American foreign policy since 1945, it’s Gold Star father Andrew Bacevich. As valuable as I found this collection, UND Press can make several simple tweaks to improve subsequent editions. First, the author’s overly brief autobiographical essay will at least introduce first-time readers to his Midwestern upbringing, first-rate academic credentials, and meritorious military career. The sole mention of his son’s tragic death appears in that piece and provides evidence of his stoicism. He describes its “excruciatingly painful” impact on him, his wife, and his daughters, before he yanks away the pity party punchbowl with a pithy, “But we endured.” He lays out his six “conservative tenets,” several of which—“veneration for our cultural inheritance,” and “a deep suspicion of utopian promises”—will send country club Republicans running for another gin and tonic. He tacks on a seventh tenet he earlier overlooked, “a collective responsibility to promote the common good,” one of the ancient Greek philosophers’ top concerns but, again, not so popular with so-called conservatives who cut taxes while they avert their gaze from our metastasizing $21 trillion national debt. Whereas Bacevich’s brief bio familiarizes readers with Bacevich the man and his thought, the absence of annotations throughout the text will leave newcomers adrift. With just the title and year of publication of the essay headlining each chapter, readers have no idea in which publication it originally appeared or what news event may have sparked it. Likewise, repetition dulls an otherwise pugnacious text. At several points it seemed as though each essay, in succession, adhered to a wearying template: “WWII ended—Pax Americana arose—Communism fell—Fukuyama stuck his foot in his mouth—the United States overstepped its unipolar moment.” Until the next editor removes such tedium, readers will profit by studying the essays over a longer period of time, unlike how this reviewer eagerly plowed through the book. Lastly, the alphabetical “Acknowledgements,” in this case a list of the articles’ original sources, don’t match up with their order in the book. These are easy fixes. And this book, and intellectual posterity, deserves it. 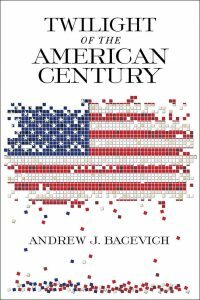 Considering the parade of play actors leading the United States diplomatic corps over the last few decades—Susan Rice, Hilary Clinton, Rex Tillerson—one can only wonder if we would instead be reading “Daybreak of the American Century” had Andrew Bacevich taken a turn at the helm. Mark G. Brennan lives in Manhattan and teaches at New York University.